The goal of building lab-grown bodily organs out of a patient’s own cells is something that Bio-engineers have been advancing toward, but a few major challenges remain – one of them is making vasculature, the blood vessel plumbing system that delivers nutrients and removes waste from the cells on the inside of a mass of tissue. Without these blood vessels, interior cells suffocate and die. Growing thin layers of cells is already possible, so one proposed solution is to “print” the cells layer by layer, leaving openings for blood vessels as necessary. The downside is that this method leaves seams in the printed output: when blood is pumped through the vessels, the seams are pushed apart. The University of Pennsylvania’s Bio-engineers have turned the problem inside out by utilising a RepRap 3DPrinter called to manufacture templates of blood vessel networks out of sugar. Once the networks are encased in a block of cells, the sugar can be dissolved, leaving a functional vascular network behind. “I got the first hint of this solution when I visited a Body Worlds exhibit, where you can see plastic casts of free-standing, whole organ vasculature,” says Bioengineering postdoc Jordan Miller. Miller, along with Christopher Chen, the Skirkanich Professor of Innovation in the Department of Bioengineering, other members of Chen’s lab, and colleagues from MIT, set out to show that this method of developing sugar vascular networks helps keep interior cells alive and functioning. After the researchers design the network architecture on a computer, they feed the design to the RepRap. The printer begins building the walls of a stabilizing mold. Then it then draws filaments across the mold, pulling the sugar at different speeds to achieve the desired thickness of what will become the blood vessels. When the sugar becomes hardened, the researchers add liver cells, suspended in a gel, to the mold. 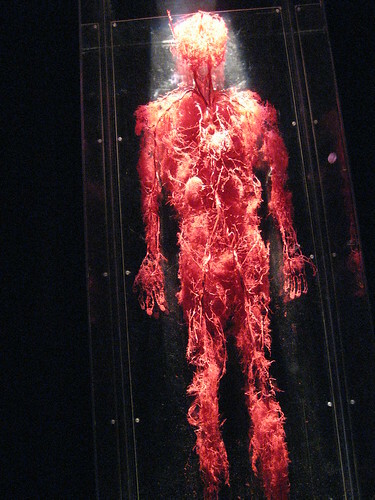 The gel surrounds the filaments, encasing the blood vessel template. After the gel sets it can be removed from the mold with the template still inside. The block of gel is then washed in water, dissolving the remaining sugar inside – the liquid sugar then empties from the vessels it has created without harming the growing cells. “This new technology, from the cell’s perspective, makes tissue formation a gentle and quick journey,” says Chen. The researchers have successfully pumped nutrient-rich media, even blood, through these gels blocks’ vascular systems. They also have experimentally shown that more of the liver cells survive and produce more metabolites in gels that have these networks. The RepRap makes testing new vascular architectures quick and inexpensive, and the sugar is stable enough to ship the finished networks to labs that don’t have 3DPrinters of their own. The researchers hope to eventually use this method to make implantable organs for animal studies.